Done your Christmas shopping yet? Feel like making a few earth-friendly purchases? The Eco Design Christmas Market, taking place in Stoke Newington on Saturday 28th November, is being put on by Future Friendly Fairs, who organise earth-friendly, ethical fairs all over London. It's a great opportunity for eco-conscious consumers to do their Christmas shopping secure in the knowledge that any items purchased are as green as the Christmas tree standing in Trafalgar Square. You'll find a huge range of original, hand-crafted, eco-friendly gifts that you won't see on the high street. There'll be clothing, jewellery, toys, handmade cards, candles, patchwork blankets and lots more besides. Many items are made with recycled and environmentally friendly materials. Traders aren't engaged in mass production or inefficient working methods and are careful to use minimal packaging for their goods. The market will be taking place in the exquisite Abney Hall on Stoke Newington's Church Street and gives shoppers the chance to meet the designers and artists who made the goods. 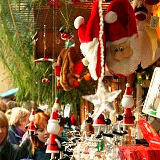 Enjoy the festive atmosphere and have fun doing some green shopping at the same time. Merry Christmas!